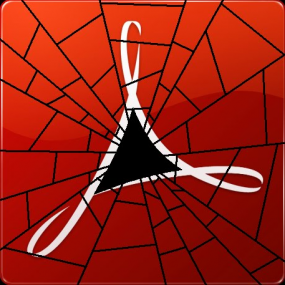 Speaking of Adobe Reader, the company today released updates to fix at least three vulnerabilities in the widely-used program. Users of Adobe Reader XI (11.0.05) for Windows and Mac should update to Adobe Reader XI (11.0.06). Obligatory note: There are other options. Adobe also pushed out patches for its Flash Player and AIR products. The Flash update brings the media player to version 12.0.0.38 on Windows and Mac OS X. This link will tell you which version of Flash your browser has installed. IE10 and Chrome should auto-update their versions of Flash. If your version of Chrome (on either Windows, Mac or Linux) is not yet updated to v. 12.0.0.41, you may just need to close and restart the browser. In addition, Adode AIR (required by some applications like Pandora Desktop, for example) was updated to v. 4.0.0.1390 for Windows, Mac and Android devices. Adobe AIR checks for and prompts you to install any available updates anytime you launch an application that uses AIR; in any case, the download link is here. 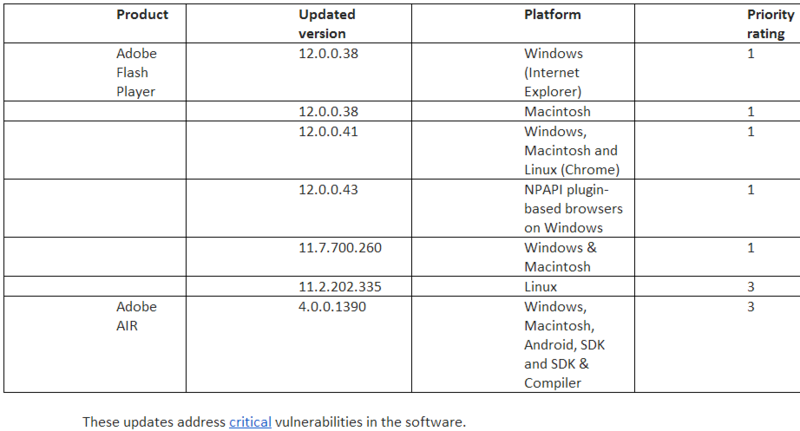 See the chart below for the updated version numbers for your operating system. 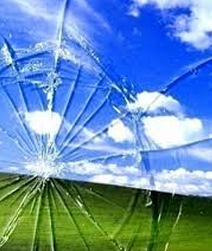 Separately, Oracle issued its critical patch update, which includes some 36 security fixes for Java. This update brings Java to Java 7 Update 51, and is available via the built-in Java updater or from Java downloads. Update, 5:33 p.m. ET: Included information about Java patches. This entry was posted on Tuesday, January 14th, 2014 at 4:20 pm	and is filed under Latest Warnings, Time to Patch. You can follow any comments to this entry through the RSS 2.0 feed. Both comments and pings are currently closed. so what your trying to say is the nsa has been exploiting these holes for 8 months? Yeah, thanks. I had that on my list but forgot to write about it. I just updated the post to include mention of the Java fixes. Just a technical clarification for the article (though it’s very clear in the above table) — the AX (IE) version of Flash for Windows is updated to 12.0.0.38, but the plugin version used with other browsers is 12.0.0.43. Presumably at some point, the AX version will be updated again to conform with the plugin version. I’m kinda surprised that the manual offline Java installer files for both 32-bit and 64-bit versions are *.com, rather than *.exe filenames — haven’t seen anyone use the .com extension for a major release in a long time. I have never relied on the auto update option so user comments are welcomed. Please remember to mention the browser and authority level, Admin or User. Well, I tried hard to upgrade Google Chrome to 32.0.1700.76 m, but it wouldn’t upgrade itself. I had no choice but to uninstall Chrome and then reinstall it for the upgrade to work. What a pain! As always, Brian, I want to thank you for keeping all of us alert and sharing so much important information with us! Would you or anybody else possibly know how I can find out which version of Google Chrome is installed on my computer? I find it in Internet Explorer under HELP > ABOUT INTERNET EXPLORER but can’t find that setting in Google Chrome. Thanks for your reply, Brian! Using your instructions, I found version 32.0.1700.76m listed under “About Google Chrome” but not 12.0.0.41, as you mentioned? That version number (32.0.1700.76m) is a Google Chrome version number. Because you are running that version (which is the latest version of Chrome), you also have the newest version of Flash installed (12.0.0.41). But don’t take my word for it: I included a link in the story that you can click to find out which version of Flash you have installed. For those that have old XP boxes around and wonder if they can swap the OS out: Anything that is at least a socket 370 (1999 or so mainboard socket, and this is as old as you’ll want to go and have the system fast enough to use for a modern OS) will run Vista (but not Win8) or pretty much any flavor of Linux alright enough. For Win7, Win8 you just need a CPU with an SSE 2 instruction and a decent amount of ram, video card, etc. There are also Linux distros such as DSL or Tiny Core Linux and either of those run on systems as old as early 90s. So unless you’re just keeping an XP system around for the hell of it or for the nostalgic factor (I have a Windows 98 486 myself) there are still some ways of getting more out of your older hardware. But the biggest worry to me are all the work places that still have XP systems, and said same places usually don’t even keep up with the Windows Updates anyway, so… As long as it turns on and it does want they want it to is about all some places care about. I thought I knew every possible variation of command prompts ever invented. You just taught me one more, the java -update one. It even works on OSX/bash. Who knew? Thanks for an excellent post, Brian. Right after the holidays, my pc caught a bug, despite my up to date internet security program and firewall. Suddenly I was plagued by constant unwanted audio audio playing in the background on my pc. My computer was literally turned into a radio, music, ads, and newscasts all day long. Worse, it was tripping the Windows DCOM application server process and shutting my entire computer down. Windows would allow changes to the process. I tried reloading the audio drivers. I tried 5-6 different, well-respected malware checking programs, including the Microsoft Security Malware Safety Scanner. The full MS scan took almost 3 hours, but nothing helped. Everyone said I was “clean,” but the music, ads, etc played on. I hired a “tech buddy” from my IS software provider, and he was totally unsuccessful in removing the problem. Searching posts found lots of people who had suffered this problem, and while people had lots of ideas, none that I tried moved this bugger an inch. I was just about to give up when a couple of your posts gave me another clue about what might be wrong. In fact, the problem was the Adobe Flash Player vers. 11, later verified on other posts once I knew what to look for. The only place that was totally silent was the Adobe site. I dumped the flash player and it has been quiet ever since. In fact, it has been so peaceful this past week that I am hesitant to reload any Adobe Flash Players, but I work in an internet-based business and I may have to. Maybe I just got a dirty file download, but some posts think that it is an Adobe Flash vers 11 a program bug. Hopefully they have de-bugged and a clean download will work. I’ll be sure to use only your links here. The same crap, from the same crap companies. I don’t use IE for any browsing. Do I even need Flash installed on it? Doug – you don’t have to have Flash installed, but many websites do rely on it for viewing portions of their content, so depending on the sites you want to view, you may find it a necessary evil to have. You can always uninstall it and see how things look. If you find you need it, simply visit the Adobe.com website, click on their Downloads link, and then re-install it. Thanks Brian really helpful article.. The list is quite long at the Live cd list; be careful of what you download from there, some programs may no longer be supported or updated. As for Linux, I didn’t check those links, I find those programs at another location. I feel a trend about Java – To me its buggy, and there are alternatives to using it. Sencha for example can be used across many platforms, and as far as I know, it uses html5. For the XP users, Windows 7 is probably as close as your going to get for an upgrade. I did move up to windows 8, and that was an awful experience. Win7 was an easy upgrade and though there may be some navigation differences, it isn’t earth shattering. Could you help me further? I only use Java for playing a couple of word games on Yahoo. Since these recent patches, I am not able to get back into the games. I have tried everything I know to figure out what I need to do. When things are going well, Java only is activated while I play these games. I get “Application Blocked by Security Settings’ but am unable to figure out what settings are blocking this. Any ideas? I would so appreciate it. Thanks for your help and information about this matter. I found this in Yahoo and it worked to enable Yahoo games. It is a copy and paste. Hope this is helpful for others. For Windows: Go to Start and click on Settings, then Control Panel Locate Java and launch it, go to the Security tab and change the vertical slider to Medium. This should fix the issue for most browsers. Some players (likely those using Firefox) may need to take one more action for games to begin working for them again. From the Firefox browser click Tools, then Options. Select Security then click the top Exceptions button. For the address of the website type *.yahoo.com and click Allow. IMPORTANT NOTE:This Known Issue post is for Yahoo! staff to communicate current known issues to benefit Yahoo! customers. We do not gain extra Answers points for questions added to this “Known Issues” category. For Mac: Click on System Preferences. In the Other section, click on Java. Click the Security tab and and change the vertical slider to Medium. This should fix the issue for most browsers. Thanks for the Mac fix… that worked! My MIL will be very happy she can play bridge again! Java is only dangerous when You enable it in a web browser, there is no need to uninstall it completely. If Java for stand-alone programs has a bug, it simply makes the stand-alone programs as hazardous as programs developed in most other languages/frameworks. Either you trust the provider of the stand-alone application, or don’t install and run his programs on your computer. The fact that they are written in Java should have no effect on your decision here. If Java *running in the browser* has a bug, it has the potential to make the *browser itself* hazardous – which has happened repeatedly. A browser plus a Java applet plus a bug means that the provider of your browser is no longer just Microsoft or Mozilla or Apple or Google – it’s them plus whoever wrote the applet. In the past, browsers and Java itself were often set up “connected” by default. So simply having Java on your system meant you were allowing applets to run unless you took steps to block them. In the face of repeated bugs, the default has now generally been reversed: Even if you install Java, your browser won’t accept applets unless you tell it to. And, in general – you should not do so. Why is it that Oracle now requires a users to login to view Java security patches? I went ahead and created an account and now it is asking for a “Support Identifier”. It seems irresponsible for Oracle to require a contract for you to even view what vulnerabilities are in their software. Does anyone know another method for accessing this data? Ignore me. I have now noticed if you scroll down far enough there is a list of all the CVE identifiers. My pc updated at 3 am cst turned it on this morning and it was like my pc was restored to factory condition. I can find my files but my desktop is empty except for recycle bin, and internet explorer has deleted all my favorites..
Microsoft doing some backsliding. 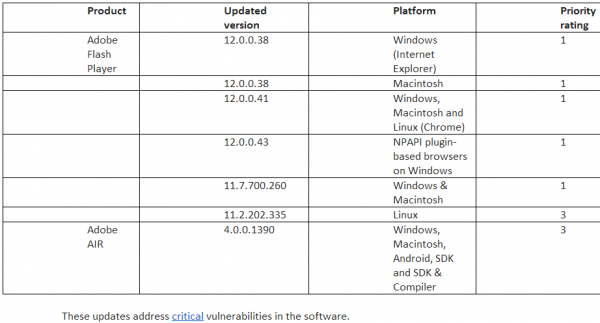 Security Essentials, Forefront to be updated on XP until 2015-07-14. Could understand doing so for Forefront on Custom Support site but consumer MSE should be clearly (in a way that is inconvenient to ignore) marked for the user as out of service. Per “Microsoft antimalware support for Windows XP” on Microsoft’s Malware Protection Center blog. Your latest post on Target, http://krebsonsecurity.com/2014/01/a-first-look-at-the-target-intrusion-malware/, 404’s. I use fulfilled by Amazon and in order to print bar codes Amazon uses a Java applet. Since upgrading to 7 update 51, every time I try to print a barcode I get redirected to the Oracle site or receive a message: unable to upload java printer applet please ensure that you have a printer installed or version 1.6 or above. I have contacted Amazon for the last few days and they say since 14 Jan 2014 this has become a Global problem. Their tech guys after 4 days came up with: Try the security slider at high and see if this cures the problem. As this is the default setting it was of course useless information. Please has anybody got know how to fix the problem. I have not been able to work for 4 days now and with very little coming from Amazon I am getting very worried about my future finances. Take a look at the following FAQ posted on the Java support website to see if it will prove helpful in resolving your problem. What’s preventing you from doing so? The new version of Java has blocked me from playing yahoo games. I have tried everything they told me to do in order to play again, i.e. move security to medium and list the http address in java to allow access but I still cannot get in. Very frustrating. I downloaded the update windows x 86 jdk-7u51-windows-i586.exe. This is 32 bit as I have found out that Firefox and Chrome work on 32 bit. Although Windows 7 is 64 bit, you have to download this version. Add the Yahoo address to the exception list. It may be /games or something I don’t know. This is a fix I used to print Amazon labels where I put https://sellercentral.amazon.co.uk in the exception list. Hope this works for you. it took me 4 days to find this work around. JRE 7u51 refuses to run older self-signed apps, may of which are critical such as KVMoIP remote management for servers. Oracle provided no simple way to override this behavior, though it appears that if one is willing to spend a few days crafting a special permissions JRE it can be accomplished. I for one have put back 7u45 (one has to erase every trace of Java including user-local files or the behavior sticks) and have no plans to update. Bad move by Oracle.